Chub fanatic Dave Slater has had an almost lifelong love affair with fishing, an affair that began some 50 years ago, when he first picked up a rod. Much of that time has been spent chasing chub, a species he considers to be special. In this series of five articles Dave (“I’m not an expert, just experienced”) is going to share some of those experiences with us. This is the first of five articles detailing my chub fishing experiences over many years. For many specialist anglers there is one special fish and, for me, this is the chub. As I live a fairly normal family life with many interests outside fishing my record is not as successful as some but I have caught a few good fish over the years. Although I fish for several other species from time to time these articles are solely about chub fishing. I hope you enjoy reading them. I was born in West Bromwich in 1949 and, being as my grandfather was a keen angler, I started fishing at a very early age. My first fishing trips were to the canal and the local park pond where I caught small roach, perch and gudgeon. My uncle also took me on occasional trip to the Severn and the Wye. It was on one of these trips to the Wye that I caught my first chub. It must have weighed only about two pounds but it seemed enormous to me at the time. I fell in love with the species instantly. In 1960 I moved to Bransgore, near Ringwood, with my parents and my two sisters. I did quite a lot of chub fishing on the Hampshire Avon, mainly at Winkton, where I caught chub to four and a half pounds on cheese. Happy days. In 1963 we moved to Doncaster, not a good move as far as the fishing was concerned. One of my school friends and I had the occasional trip to the Yorkshire rivers with his father. We managed to catch a few small chub. When I left school in 1965 I returned to the Birmingham area and, after a very brief spell working in an insurance office, I embarked on a career as a musician, something I had done semi-professionally during my school days. I finished up in Germany and fishing was forgotten for a few years. Eventually I decided on a more conventional lifestyle and moved to Slough in the early 1970’s and took up accountancy. A holiday in Bournemouth with a couple of dart-playing friends was the catalyst for taking up fishing again. Although the nightlife was good we were bored during the days. We bought some cheap tackle and spent the days on the Royalty. We didn’t catch much but it was very enjoyable. When we got back to Slough one of my friends took me to the Thames at Maidenhead where he had fished in his youth. We caught bleak and dace. Some guys turned up to do some night fishing. My friend went home but I stayed. I fished with the others under a bridge. They had a huge Tilley lamp, which illuminated all of our rods. They let me have some of their lobworms and I caught four good chub before I went home the next morning. I fished there on a fairly regular basis after that. Good chub were caught on cheese and on lobworms. I managed to catch two big ones of 5lb 1oz and 5lb 2oz, one in September and one in October. I also fluked one of exactly 5lb from a gravel pit on a sprat intended for a pike. I was hooked on fishing again and I branched out into fishing for various species. I spent a lot of my time fishing stillwaters for tench, carp and pike. I also found some nice club stretches on the Thames, which were fairly local to me. My river fishing was carried out at night because of the boat traffic. I became fairly proficient at stillwater fishing and, in the late 1970’s, when I started catching carp and pike to over 20lb, I invested in a camera. Although my stillwater fishing was going quite well I didn’t catch any really big river fish, even though this was the type of fishing I enjoyed most. I did manage to catch a lot of fish despite the lack of size. I cringe now when I think of my approach to river fishing in those days. I used a pair of Jack Hilton carp rods and watched the rod tops, which were illuminated by a large torch. My baits were invariably cheese and luncheon meat. The strange thing was that I seemed to catch most of my chub on the luncheon meat rod and most of my barbel on cheese. I also did some daytime fishing on a Thames backwater with a work colleague who was into match fishing. We caught some tremendous bags of chub, but nothing of any size. Although I became increasingly involved in stillwater fishing I still loved fishing the river and also had the occasional trip to the Kennet and the Hampshire Avon with friends. Something then happened which was to cause a radical change in my fishing. Carp fishing became increasingly commercialised and instant baits became available. This was not to my liking as the waters I was fishing at the time became busier and, at the end of the 1982/1983 season, I made the decision to concentrate solely on river fishing. As chub were such a lovely fish I decided to concentrate on them. One of the clubs I was a member of, Gerrard’s Cross, had a stretch of the river Cherwell which was reputed to hold some good chub so I decided to start there. I bought a nice 10ft rod with a built-in dockey tip and decided to start with 5lb Maxima and size 6 Au Lion d’Or hooks. I walked the stretch a few times during the close season and it was like paradise. Above the car park looked the best area, with lots of trees and features. I spent the 1983/1984 season on the area above the car park and caught literally hundreds of chub. These were nearly all caught on cheese and, although most of them weighed over 3lb, there were only two four pounders. I thoroughly enjoyed myself and it was rare to see another angler on the stretch. Two things were to happen which were to improve my fishing dramatically. I spoke to a friend from tench fishing circles, Graham Cornish, about the Chub Study Group and asked how to apply to join. I applied and was accepted for membership. This proved to be the best thing I have ever done as, in addition to making some really good friends, I obtained a lot of useful information from some excellent anglers. Also Peter Stone’s excellent book ‘Fishing for Big Chub’ was published. In the book Peter said to write to local experts for advice. I wrote to Peter and received a very nice reply. It turned out that Peter knew the stretch I was fishing and he gave me some very useful advice. I also spent a lot of time talking to some of the match fishermen about the stretch. As a result of all this I spent most of my time during the 1984/1985 season in the area below the car park. Although I caught fewer fish the average size improved immediately. I started fishing the areas recommended by the matchmen and caught a 4lb 2oz chub at my first attempt. I caught many good chub, mainly on Spam, and in September I was rewarded with a new personal best of 5lb 3oz. I spent the rest of the season fishing the areas Peter had recommended in his letter. These were even better than the areas the matchmen had recommended. October was a great month. I caught a 5lb 2oz chub from the Cherwell and a 5lb 3oz chub on a visit to the Dorset Stour, the Stour fish being taken on maggot feeder. In November I caught another big one of 5lb 1oz from another area Peter had recommended. Sessions on the Cherwell were broken up by occasional visits to the Dorset Stour. I finished the season with 14 chub of over 4lb, including four over 5lb – very good going in those days. Towards the end of the 1984/1985 season a decision was taken to move to Ringwood. This was the best decision of my life. I knew the area from my younger days and had settled in before the next season. I really loved the area. The next few seasons were spent getting to know the local fishing. I already knew quite a few stretches of the Hampshire Avon and one or two stretches of the Dorset Stour. I spent a lot of time higher up the Stour than I had fished before and, although results were not spectacular, I caught quite a few chub. These were mainly caught on sweetcorn in daylight hours or cheese after dark. I also found some quiet stretches on the Hampshire Avon and started to catch a few decent chub there, although the average size seemed far greater on the Stour. I found sweetcorn to be very effective in the summer on the Avon, with the maggot feeder a better bet in the winter. It was on a session on one of these stretches on the Avon that I was to meet Bill Neal, who was to become a major influence on my chub fishing. Also, following the sad death of Richard Walker, Peter Stone became President of the Chub Study Group. 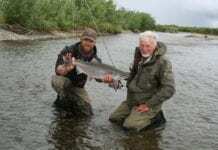 I was privileged to meet Peter and to fish with him on a few occasions. I loved to hear his tales of fishing with Richard Walker and the Taylor brothers. By the time the 1980’s came to an end I felt that, although I had not caught many big chub, I had built up a good knowledge of the local rivers and settled in well. As well as building up my knowledge of the Avon and Stour during the late 1980’s I also spent a lot of time in pursuit of the chub I had found in various local stillwaters. The writings of Peter Stone had really fired up my imagination. Strangely, I did not catch any chub, or even have any runs, on deadbaits. On one large pit the float was the best method, with all of the chub I caught being taken in deep marginal areas. On the small lakes the maggot feeder was usually the best method. The bites from these chub were very delicate and I started using very light quivertips and small hooks. There were huge chub clearly visible in these lakes but the best I could manage was a little over 5lb. Sometimes, usually in very cold weather, the chub would prefer a large piece of meat to the maggots. Looking back I probably spent a little too much time after these stillwater chub but some of the chub I saw were VERY big.